Decide is a free Web app that launched in June this year with the goal of bringing more transparency to your electronics purchases by providing you information about potential price drops for them in the near future. The service launched an iPhone app on Wednesday and added 33 new categories to make you thriftier this holiday season. 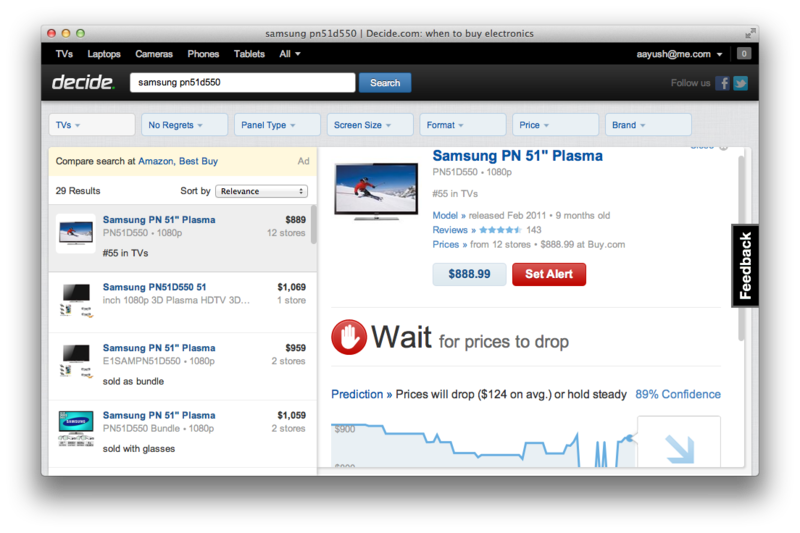 The idea is simple: before you go out and buy an electronic gadget, log on to the website and run a search for it. Decide shows you the lowest price it is available at among a variety of stores and, crucially, predicts whether it will increase, decrease or hold steady in the coming weeks. It even rates its own predictions, so you know just how confident it is about the decrease or increase it foresees. You get a graph of the product’s price history so that you can assess its volatility, along with an estimate of how much the price is likely to change by in the future. Founded by an Internet search engineer Oren Etzioni and four computer science students from the University of Washington, Decide has raised $8.5 million in venture capital funding so far. It bases its predictions on analysis of past price points of every product in its catalogue by its team of “engineers, computer scientists and product marketers from Farecast, Zillow and Amazon”. Decide expanded its range of products to include those from 33 new categories. Whereas previously it could just tell you about cameras, notebooks, phones and televisions, it now has a comprehensive database that includes home audio systems, computer components and accessories, games and tablets. The new iPhone app lets you do comparison shopping within the United States while sitting in front of your computer or browsing through stuff in a store. It lets you scan QR codes and bar codes and tells you if you can find the same product at a lower price anywhere in your vicinity or online. You can also search for specific items or browse through the categories. The price prediction feature tells you whether you should wait to buy an item or if it’s OK to buy it now, and includes approximations about the certainty of its own predications and a graph of the prices in the past, just like the website. The app itself is not as polished as we’d have liked, with jerky scrolling and an ever-present lag throughout the interface, but it does get the job done.